God, I wish I had been able to hear her speak. But your words swept me away; i felt the emotion of the event through you. And this: “If we don’t have ourselves, we have nothing.” This is the elusive holy grail for so many of us. The thing which leaves us feeling lost and rudderless, when we think we have to give ourselves to our children. Such a gift to reclaim ourselves. Get her book. At the library or somewhere. She writes like she talks. It’s amazing. I heard her speak once too. She is amazing. This is a beautiful post. She’s captivating, right? I was on my feet clapping the moment she was done. An incredible lady. Oh, wow, Alysia! I am so glad you got to hear her talk. I hope someday to have the same experience! And thank you for linking to my LEGO page! You’re very sweet to do so. And thank you for starting the Oxygen Mask Project. I know it might sound dumb, but it has made a tremendous difference in my life. All of a sudden, I catch myself thinking about it at odd times. I have started giving myself permission to do things for myself–like rest and exercise. I even started a Moms’ night out for my local autism/special needs mom friends. And miraculously, I haven’t felt guilty for doing these things, taking this time. I think it’s because you guys gave me the permission and encouragement to do so. You are making a big difference in so many ways! not dumb at all. I totally totally get it. I do the same thing – when I have a moment I ask how can I use this for me? And your Lego club is huge Patty. HUGE. It’s for Danny but it’s for you too. Very impressive. I got choked up just reading this….can’t imagine being there in person! I think your post is quite eloquent (not to dismiss the others…) You do amazing work for this Autism community. I, for one, am grateful that I stumbled upon your blog, the SPD Blogger network, and have been following the Oxygen Mask Project since the beginning. It is so simple, but something that I often forget…to take care of me. I get my daily reminders via FB and twitter now, and it helps. Immensely. Thank you. I’m grateful for those daily reminders too and for the people like you that I’ve met along the way. Check out her book. I promise you won’t regret reading it. “If we don’t have ourselves, we have nothing.” Amazing. How I wish I could have been there. So inspiring. I wish I could have been there. Oh your post is beautiful. I can see you sitting in that chair listening and soaking in every work. Now you have given us the gift of sharing it with us. You have given us the gift of the Oxygen Mask Project. And as always the most precious gift of the words on your blog. It was a wonderful post. I thank you!!! 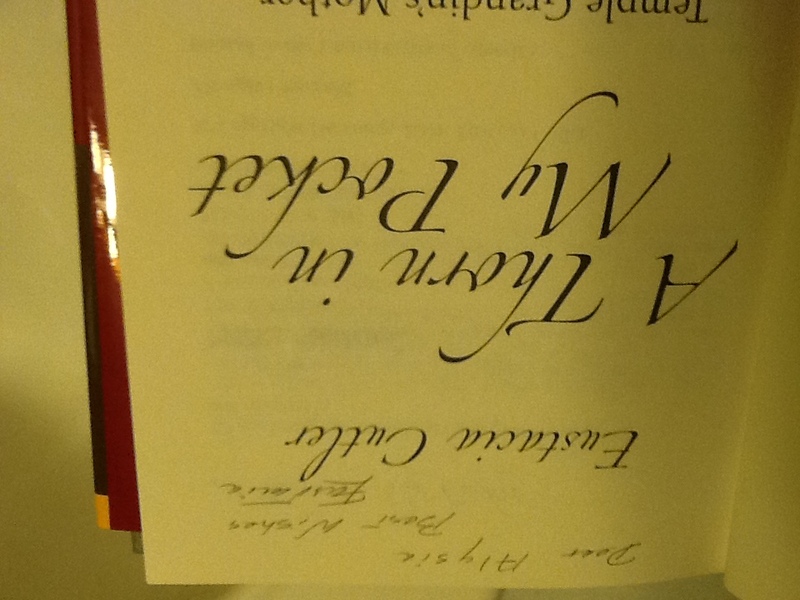 thank you so much for putting into words your time with Eustacia Cutler. i love the snippets and phrases you shared. what an amazing, inpsiring woman. She sounds like an absolutely amazing woman — one of those true gifts to have on this planet. I will definitely add her to my reading list.